As a commercial supplier of material we produce products which, to the best of our ability, are fit for purpose. As per the commercial suppliers code of conduct (agreed with SQA) all examinations centres are directly responsible for the evidence which they produce to support candidate claims for exceptional circumstances. Occassionally we release updates to materials to correct known issues identified from customer feedback. All such updates are available to all customers as a download from their account. A release announcement will be made on our web site (http://www.perfectpapers.net) with instructions for customers. Customers without an account will require their product download code to access the update. Product updates are not available for shipping by any other method. 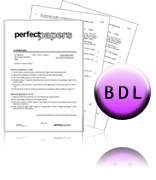 All our materials are the copyright of Perfect Papers or are reproduced with permission from other copyright owners. All rights are reserved. Our materials may be retrieved and downloaded for use only with in the terms of the license issued. No materials may otherwise be copied, modified, published, broadcast or otherwise distributed without the prior written permission of Perfect Papers unless covered by a GNU/GPL license. 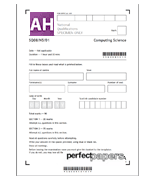 Perfect Papers makes no warranties or representations of any kind concerning the accuracy or suitability of the information contained on our web site for any purpose. All such information is provided `as is` and with specific disclaimer of any warranties of merchantability, fitness for purpose, title and/or non-infringement. Perfect Papers makes no warranties or representations of any kind that the services provided by us will be uninterrupted , error-free or that the web site or the server that hosts the web site are free from viruses or other forms of harmful computer code. In no event shall Perfect Papers, its employees or agents be liable for any direct, indirect or consequential damages resulting from the use of this web site or our material. This exclusion and limitation only applies to the extent permitted by law and is without prejudice to any express provisions to the contrary in any written licence or subscription agreement from Perfect Papers in respect of the use of any online service or material provided by us or via this web site.